Help Grandma's Gifts while shopping (and without spending more money)! We like... hold up, we LOVE that more businesses are starting to think about how they can work with their current customers to make a bigger difference in the world. Here are three ways people can make a difference without spending more money... but letting us know you love Grandma's Gifts everyday! Have an Amazon account? Want to help Grandma's Gifts without spending additional money? We have the answer -- Smile.Amazon.com will allow our supports to directly support Grandma's Gifts! When first visiting AmazonSmile, customers are prompted to select a charitable organization from almost one million eligible organizations. For eligible purchases at AmazonSmile, the AmazonSmile Foundation will donate 0.5% of the purchase price to the customer’s selected charitable organization. The AmazonSmile Foundation is a 501(c)(3) and all donation amounts generated by the AmazonSmile program are donated to the charitable organizations selected by Amazon customers. Amazon pays all expenses of the AmazonSmile Foundation; they are not deducted from the donation amounts generated by purchases on AmazonSmile. Kroger is committed to helping the communities grow and prosper. Year after year, they assist local schools, churches and other non-profit organizations by providing millions of dollars through the Community Rewards Program. This program was designed to make fundraising easy. For those who are Kroger customers, you do not have to pay to participate. The great part is that Kroger will donate a portion of your spending on gas, groceries, and gift cards to eligible, enrolled nonprofits, like Grandma's Gifts! 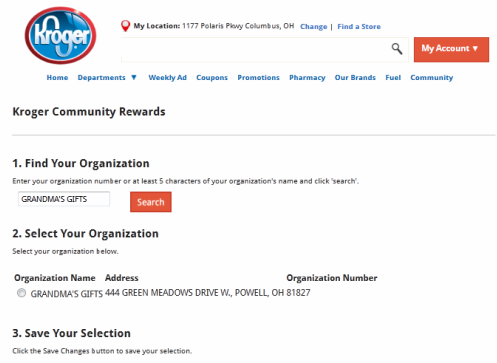 Note: You will need to have a Kroger Plus Card to register for the Kroger Community Rewards Program. Specifically to register you will need the 12 or 13 digit number on the back of your Kroger Plus Card. If you do not have a Kroger Plus Card, you can apply for one online or complete an application at your local store. 4. Click on "Account Settings"
5. Scroll down to see see "Community Rewards" and click. 7. Select our organization by clicking on the button and saving changes.